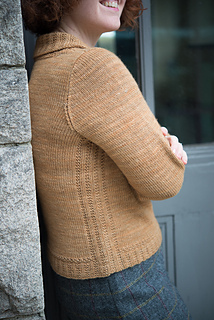 You can buy a Courant pattern in one of two ways! Technical editing by Alison Green. Photo credit Jonathan Herzog. Courant is a figure-flattering take on a classic pullover with modern touches. The ultra-long sleeves and wide turtleneck balance one another out; combined with the short sweater length, they give a balanced and timeless look to the sweater. 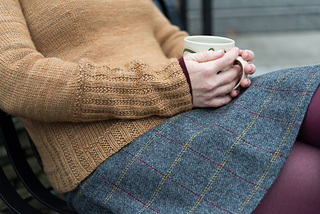 The sleeves are extremely long, to facilitate a “leg-warmer” feel; please choose a yarn with a bit of memory and “scrunchability” to achieve the look shown here. 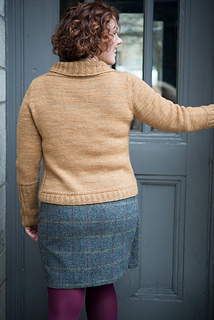 The sweater is worked in pieces from the bottom up and then seamed; edges are trimmed in a combination of broken rib and seed stitch. 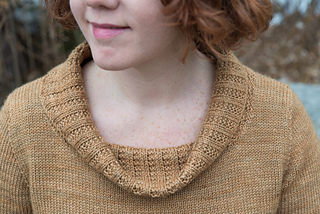 The wide, shallow turtleneck is added after seaming and worked in the round. The Knitting Boutique’s Severn is a beautiful Blue Faced Leicester and silk blend from a farm local to the Knitting Boutique shop, in the greater Baltimore area. It is dyed in a beautiful, subtle, utterly clothing-appropriate set of colors and provides a lovely drape and luminosity to the finished fabric. If you choose to substitute yarn, choose a blend with elasticity and drape, with a soft hand. You will need approximately 913 (984, 1067, 1114, 1227, 1282, 1347, 1428, 1517, 1595, 1715, 1872) yds/833 (898, 973, 1017, 1120, 1170, 1229, 1303, 1384, 1455, 1565, 1708) m.
Courant offers great options for all body types. As written, the wide neckline, combined with the super-long sleeves and short sweater length, make a proportional figure shine. 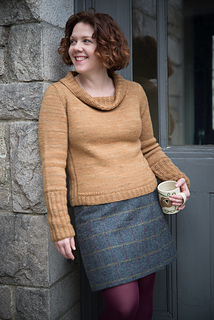 The broken rib lines up the sweater sides, and thick sleeve edging, accentuate waist curves. Top-heavy shapes might consider narrowing the neckline slightly and/or lengthening the body. Bottom-heavy shapes might consider shortening the sleeves (either just slightly, to avoid the “legwarmer” look, or to a different length entirely). 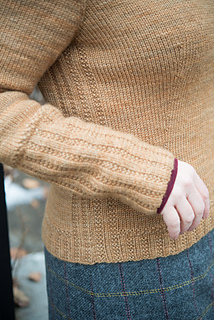 Shortening the sleeve ribbing would also be effective.